By laying sod down, you can have an instant green lawn that will make you the envy of your neighborhood. It does take planning and preparation, but you can do it yourself and save money. It’s as easy as 1-2-3. Remember to use Far West Turf Farm and Nursery, best source for sod, Vancouver WA. 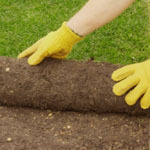 Prepare: by removing any old lawn, rototilling, smoothing and rolling the ground with a water roller to firm it up. Sprinkle with water to moisten and help compact. Keep moist until you are ready to install the ground. More on preparing for your new lawn. Measure and Order: Measure the length times width to get the number of square feet and then add 10-15% to allow for trim and waste. More tips on measuring. Order sod – Vancouver WA from Far West Turf Farm and Nursery the day before you are going to install it. Install: Just before installation, Apply 16-16-16 fertilizer (1 pound per 100 sf). Apply lime at 5-8 pounds per 100 sf. Lay your sod out keeping the edges firmly together. Roll the sod with a half full water roller to help the sod to take root. Water immediately after and then sit back and enjoy your new lawn. More sod installation tips. I live in Washougal, WA and have a side yard that is approximately 600 sf of level ground that currently has a thin layer of wood chips installed. The area should receive approximately 5 to 6 hours of sun every day and is partially shaded. Can you recommend a good grass for this area and give me a price for 600 sf of sod? Is there a charge for delivery or can I pick up in your location? I have a Hyundai Santa Fe SUV. How soon can I get the sod and do you accept Master Card? I like how you suggested that right before installation, you should lay down fertilizer. I am installing new grass in my lawn. Thanks for the tips on laying sod.